The SpaceX Dragon cargo craft was successfully launched on the Falcon 9 rocket from Launch Pad LC-40 at Kennedy Space Center, Florida. 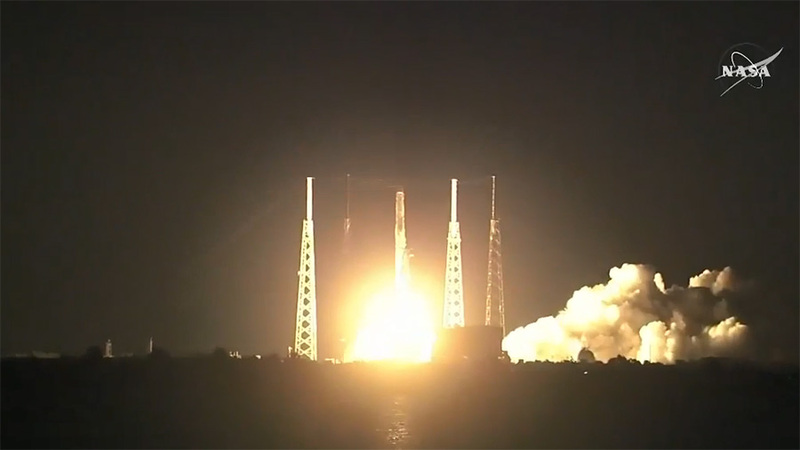 Dragon successfully launched on the SpaceX Falcon 9 rocket at 5:42 a.m. EDT from Cape Canaveral Air Force Station. The spacecraft’s solar arrays have deployed. It will arrive at the International Space Station Monday morning carrying more than 5,900 pounds of research investigations and equipment, cargo and supplies that will support some of the hundreds of investigations aboard the orbiting laboratory. A postlaunch press conference will take place at 8 a.m. on NASA Television and the agency’s website. 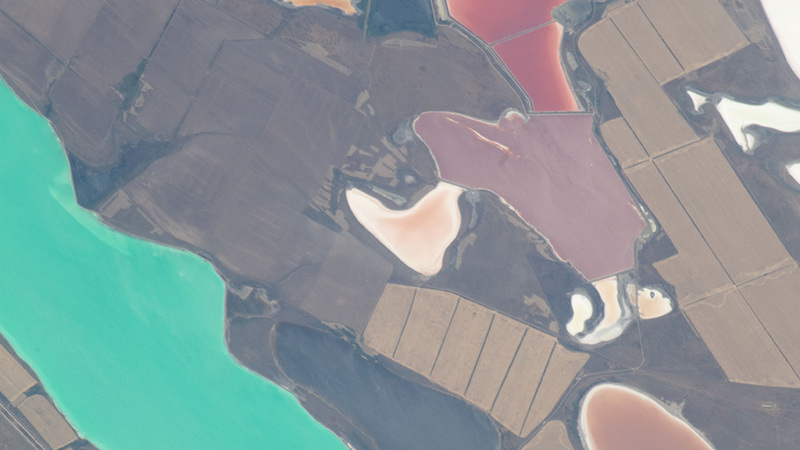 An Expedition 56 crew member aboard the International Space Station pictured lagoons in the Crimea between the Sea of Azov and the Black Sea which appear different colors due to shallow waters and their varied chemical composition. Today’s science activities aboard the International Space Station are looking to improve cancer therapies and benefit cement processing on Earth. Meanwhile, two astronauts are practicing to capture the SpaceX Dragon cargo craft next week. Cancer research in space can unlock positive benefits that are cloaked by Earth’s gravity possibly leading to advanced therapies. Flight Engineer Serena Auñón-Chancellor is preparing for the Angiex Cancer Therapy experiment which will be delivered aboard the SpaceX Dragon. She is setting up the Microgravity Science Glovebox for the study that may lead to safer, more effective vascular-targeted drugs without animal testing. Flight Engineer Ricky Arnold mixed cement samples today for stowage and future analysis on Earth. Studying how cement reacts in space during the hardening process may help engineers better understand its microstructure and material properties. Observations could improve cement processing techniques on Earth and lead to the design of safer, lightweight space habitats. 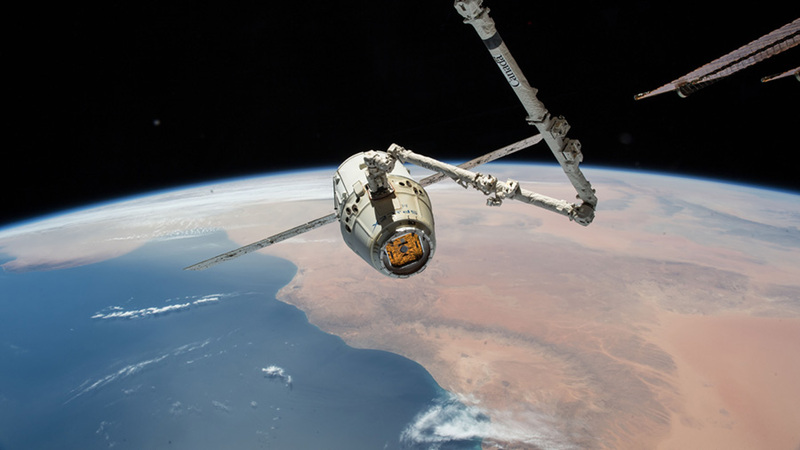 Arnold will lead Monday morning’s capture of the SpaceX Dragon when he commands the Canadarm2 to grapple the space freighter Monday at 7 a.m. EDT. Commander Drew Feustel will back him up in the Cupola monitoring its approach and rendezvous. The duo set up the Cupola today and practiced the robotic maneuvers they will use to capture Dragon when it reaches a point about 10 meters from the station. NASA TV begins its live broadcast Friday at 5:15 a.m. EDT of Dragon’s launch aboard the SpaceX Falcon 9 rocket. Dragon will blast off at 5:42 a.m. from the Kennedy Space Center on a three-day trip to the orbital lab carrying almost six thousand pounds of new science experiments, crew supplies and space station hardware. NASA TV will be back on the air Monday at 5:30 a.m. covering Dragon’s approach and rendezvous and again at 9 a.m. for Dragon’s installation to the Harmony module. 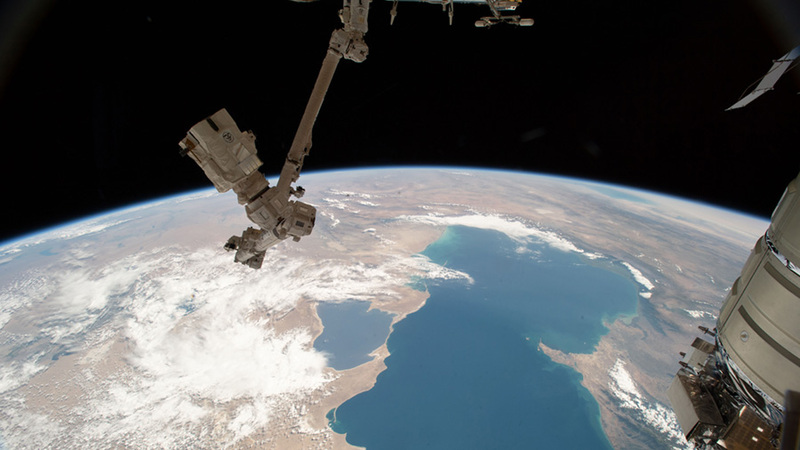 Canada’s 57.7-foot-long robotic arm, also known as the Canadarm2, with a latching end effector at its tip (used to grapple approaching spacecraft and portable data grapple fixtures) is pictured in the foreground as the International Space Station was orbiting over the Caspian Sea. The Expedition 56 crew members are configuring the International Space Station for several new experiments being delivered on the upcoming SpaceX Dragon cargo mission. The orbital residents also explored space physics and serviced U.S. spacesuits. NASA astronauts Drew Feustel and Ricky Arnold worked on science hardware today to support new research being delivered aboard Dragon when it arrives Monday at 7 a.m. EDT. The duo also continued studying the robotics procedures necessary to capture Dragon after its approach and rendezvous next week. Feustel cleaned a mouse habitat for the Rodent Research-7 experiment observing microbes in the gastrointestinal system in mice. Arnold checked out the functionality of the Veggie facility that will process plants for the Veg-03 study researching how to grow food in space. Flight Engineer Serena Auñón-Chancellor looked at how cement solidifies in space exploring its microstructure and material properties. Results could impact the design of lightweight space habitats and improve cement and concrete processing on Earth. Finally, Alexander Gerst of the European Space Agency looked at spacesuit gear and set up the Quest airlock for future spacewalk operations. Gerst purged nitrogen from the suit’s oxygen lines and helped ground controllers prepare for overnight oxygen leak checks. The SpaceX Dragon cargo craft is pictured in the grips of the Canadarm2 robotic arm as the International Space Station was orbiting above northern Africa on May 5, 2018. The Expedition 56 crew members are getting ready for the arrival next week of the 15th SpaceX Dragon mission to the International Space Station. The space residents also explored how microgravity impacts health and physics today while setting up a variety of cubesats for deployment. The Falcon 9 rocket from SpaceX that will launch the Dragon space freighter into Earth orbit is due to lift off Friday at 5:41 a.m. EDT and take a three-day trip to the orbital laboratory. The commercial space freighter will be loaded with almost six thousand pounds of new science experiments, crew supplies and space station hardware. NASA astronaut Ricky Arnold will be backed up by Commander Drew Feustel in the Cupola when he commands the Canadarm2 to grapple Dragon Monday at 7 a.m. The duo is reviewing procedures and training on a computer this week for the rendezvous and capture activities. Robotics controllers on the ground will then take over after the capture and remotely install Dragon a couple of hours later to the Harmony module where it will remain for 32 days. NASA TV will broadcast live the Dragon science briefings, launch, capture and installation activities. 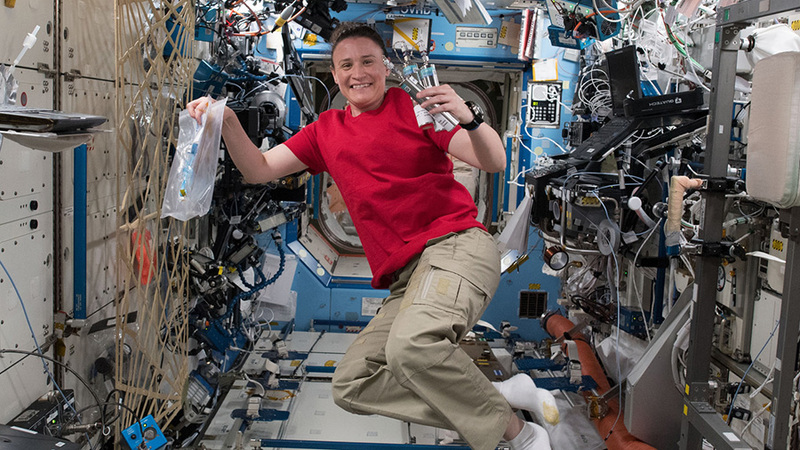 Feustel started the workweek collecting and stowing biological samples for the Multi-Omics study that is observing how gut microbes may affect an astronaut’s immune system. He then worked on the Atomization experiment that is researching liquid spray processes to potentially improve the design of jet and rocket engines. NASA astronaut Serena Auñón-Chancellor installed a cubesat deployer on a multi-purpose experiment platform that will soon be placed outside the Japanese Kibo laboratory module. It will deploy nine different cubesats to continue space research and demonstrate space applications. Astronaut Alexander Gerst is seated in the Columbus laboratory module participating in the Grip study. 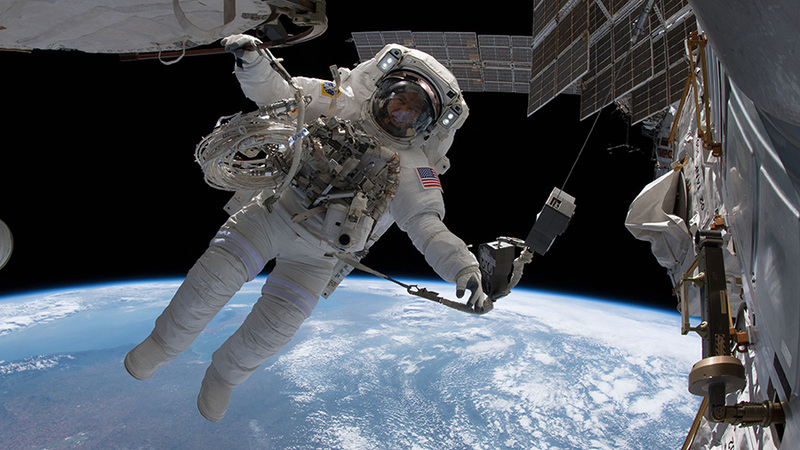 Grip is researching how the nervous system adapts to microgravity. Observations may improve the design of safer space habitats and help patients on Earth with neurological diseases. The Expedition 56 crew members researched microbes and plants today and conducted more eye exams to benefit future space residents as well as people on Earth. The Cygnus space freighter continues to be packed for its release in July as robotics controllers get ready to inspect the vehicle. NASA astronaut Serena Auñón-Chancellor stowed genetically modified microbes in a science freezer that will be analyzed for their ability to compete with petrochemical production processes on Earth. Flight Engineer Ricky Arnold, also from NASA, thinned plants for the Plant Habitat-1 experiment that is comparing plants grown in microgravity to those grown on Earth. Arnold and Auñón-Chancellor later joined Commander Drew Feustel for more eye checks. The trio used optical coherence tomography to capture 2D and 3D imagery of the eye to help doctors understand how living in space affects eyesight. European Space Agency astronaut Alexander Gerst was packing Cygnus with trash and old gear today ahead of its July 15 release. The Northrop Grumman (formerly Orbital ATK) Cygnus commercial space freighter with its cymbal-like Ultra-Flex solar arrays and the Soyuz MS-09 spacecraft are pictured in this fish-eye lens view from a window on the International Space Station. Quite a wide variety of science activities took place today aboard the International Space Station exploring time perception, exercise and eyesight. The Expedition 56 crew members also worked on station plumbing, stowed satellite deployer gear and checked out communications gear. 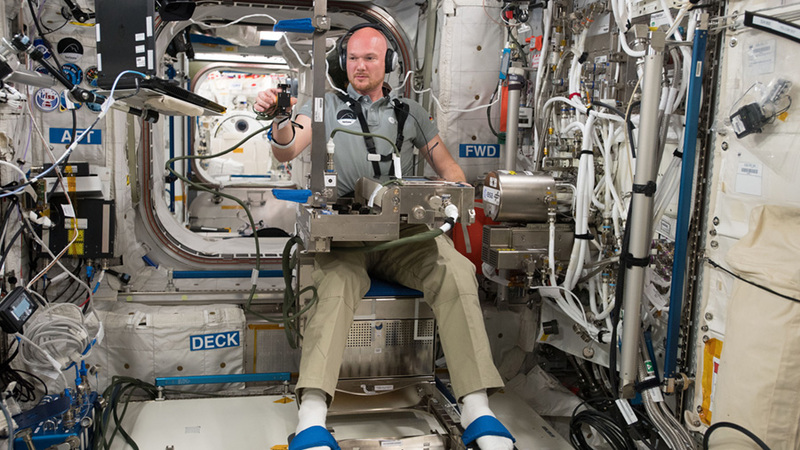 Two-time station resident Alexander Gerst started his morning helping doctors understand how living in space alters time perception and impacts crew performance. Later he strapped himself into an exercise bike and attached electrodes to his chest to monitor his pulmonary function during the workout session. NASA astronauts Ricky Arnold, Drew Feustel and Serena Auñón-Chancellor teamed up for eye exams with an ultrasound device to study microgravity’s effects on eyesight. The scans were downlinked real-time to scientists on Earth observing the retina and optic nerve while monitoring the health of the astronaut’s eyes. Auñón-Chancellor started her day changing out a filter and valve in the station’s bathroom located in the Tranquility module. 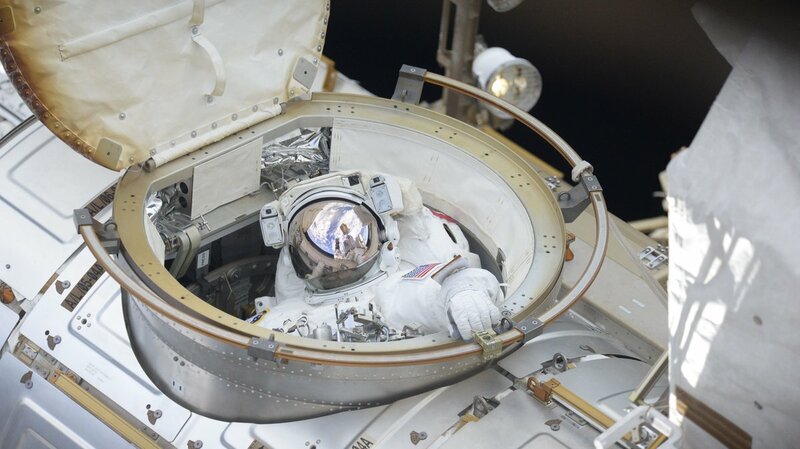 She then checked out Wi-Fi gear connected to antennas installed during a March 29 spacewalk after assisting Feustel in the Japanese Kibo lab module. The duo stowed gear after Wednesday’s successful deployment of a satellite to demonstrate space junk clean up. 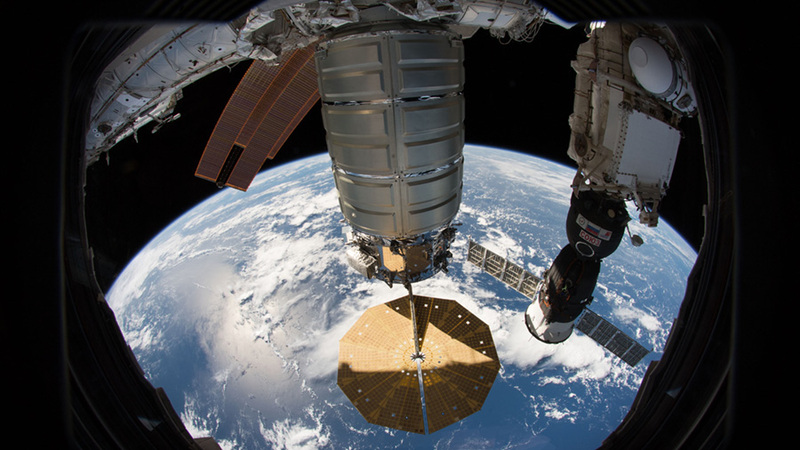 Arnold was set to install radio frequency tags today to improve tool tracking but that task was postponed till after the Cygnus cargo ship departs July 15. He then moved on to emergency communication tests with control centers around the world before light maintenance work on a 3D manufacturing device. Astronaut Serena Auñón-Chancellor collects breath samples to analyze and measure red blood cell function for the Marrow investigation. The International Space Station deployed a satellite this morning to demonstrate the potential of removing space junk. Back inside the orbital lab, the Expedition 56 crew explored space physics, studied human research and conducted an emergency drill. A new satellite was deployed into space today from outside the Japanese Kibo laboratory module. Officially named the NanoRacks-Remove Debris satellite, it will explore using a 3D camera to map the location and speed of space debris. It will also deploy a net to capture a nanosatellite that will simulate space junk. NASA astronaut Ricky Arnold worked inside the Microgravity Science Glovebox to troubleshoot gear today for a semiconductor crystal growth experiment. Alexander Gerst, of the European Space Agency, set up dosimeters and measured the station’s acoustic levels to understand the effects on crews. Arnold later joined fellow Soyuz MS-08 crewmates Drew Feustel of NASA and Oleg Artemyev of Roscosmos for an emergency drill. The trio practiced evacuating the station in their Soyuz crew ship in the unlikely event of an emergency. U.S. and Russian cargo ships are due to launch to the space station this summer. Another cargo craft is due to end its stay at the orbital lab next month. SpaceX is counting down to a June 29 launch of its Dragon cargo ship. Roscosmos will launch its Progress 70 cargo craft on July 9. Finally, the Cygnus space freighter attached to the Unity module is due to end its stay July 15. NASA astronaut Drew Feustel is pictured tethered to the International Space Station just outside of the Quest airlock during a spacewalk he conducted with fellow NASA astronaut Ricky Arnold (out of frame) on June 14, 2018. The Expedition 56 crew‘s schedule is full of space science today as cleanup continues after last week’s spacewalk. The International Space Station’s three newest crew members also brushed up on their safety skills. Biology and physics were just part of the microgravity research taking place aboard the orbital laboratory today. NASA astronaut Serena Auñón-Chancellor started her day collecting blood and urine samples for a trio of ongoing human research studies. She then joined European Space Agency astronaut Alexander Gerst for the Myotone study observing how long-term space missions impact the biochemical properties of muscles. Gerst also researched ways to simplify and speed up procedures for astronauts for the Everywear experiment. Auñón-Chancellor, Gerst and cosmonaut Sergey Prokopyev also gathered midday to review the location of safety gear throughout the space station. The trio also practiced emergency communication in the station’s Russian segment. NASA astronaut Ricky Arnold spent the day cleaning soot created in a burner during a run of the Advanced Combustion Microgravity Experiment. That study is exploring ways to improve fuel efficiency, reduce pollution and prevent fires in space. Cosmonauts Oleg Artemyev and Prokopyev explored how living in microgravity affects their daily exercise regimen. 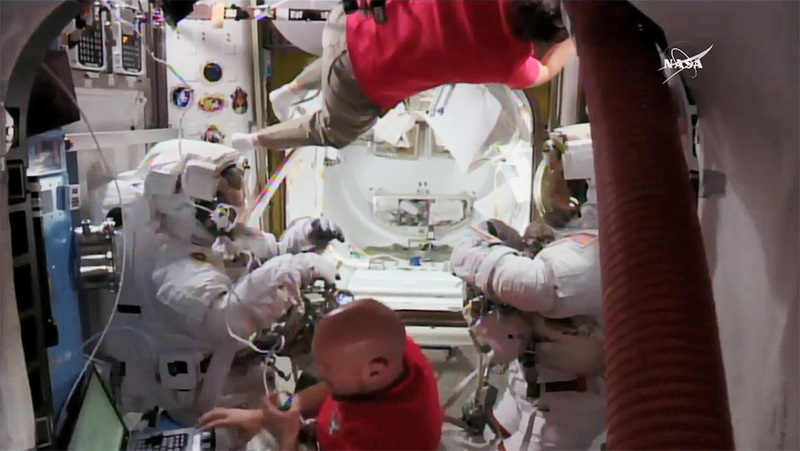 Commander Drew Feustel worked in the Quest airlock today continuing cleanup activities after Thursday’s six-hour, 49-minute spacewalk. Feustel scrubbed the U.S. spacesuit water loops then tested water samples for conductivity before wrapping up his day.